Happy Canadian Thanksgiving, My Dear Friends. 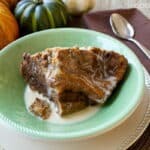 Whether you celebrate this holiday or not, I welcome you to my slow cooker recipe for Breakfast Pumpkin Bread Pudding. 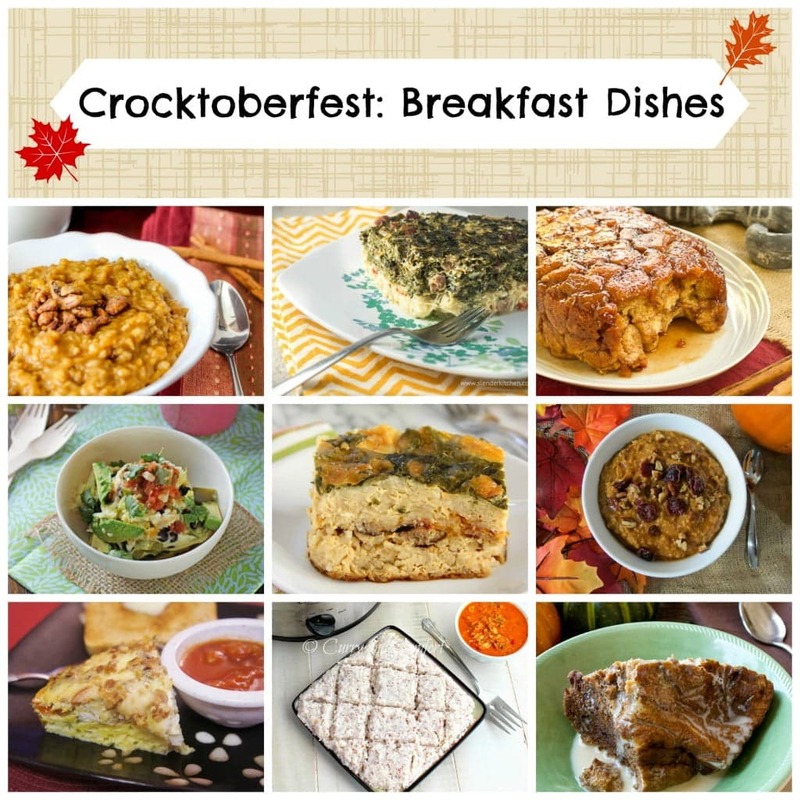 I’m also sharing links to breakfast slow cooker recipes from some of my favorite bloggers who are part of #Crocktoberfest2013. I’m a skeptic when it comes to slow cooker recipes. I never believe they’ll turn out as expected. Really? Put the ingredients in there and walk away? When I come back it will be dinner? Are you sure? I spend the 6-8 hours while dinner cooks whirling with frantic doubts wondering if I’ll have to order pizza when dinner is ruined. I’m amazed with the results every time. When I signed up for the Food Blogger Slow Cooker week, I decided to challenge my inner slow-cooker-skeptic by making a breakfast. (Imagine how badly I slept due to all those nightmares of our ruined breakfast filling my head). 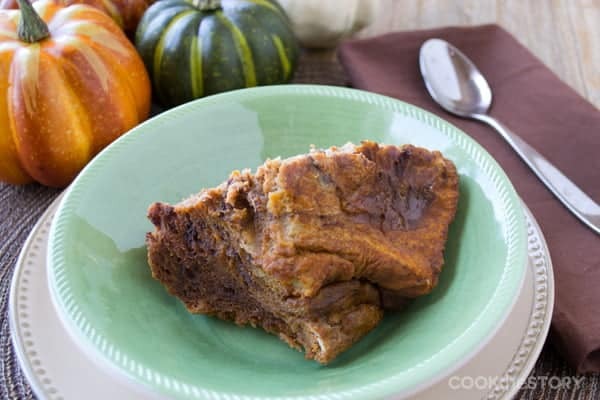 It did take a few tries (and a few sleepless nights) to get the breakfast pumpkin bread pudding right. But in the end, this slow cooker recipe amazed me as much as all those dinners have. You layer bread with an easy batter in the slow cooker, cover it, put it on low and let it cook. You wake up to a house that smells like pumpkin pie. And then you eat breakfast that tastes like pumpkin pie. 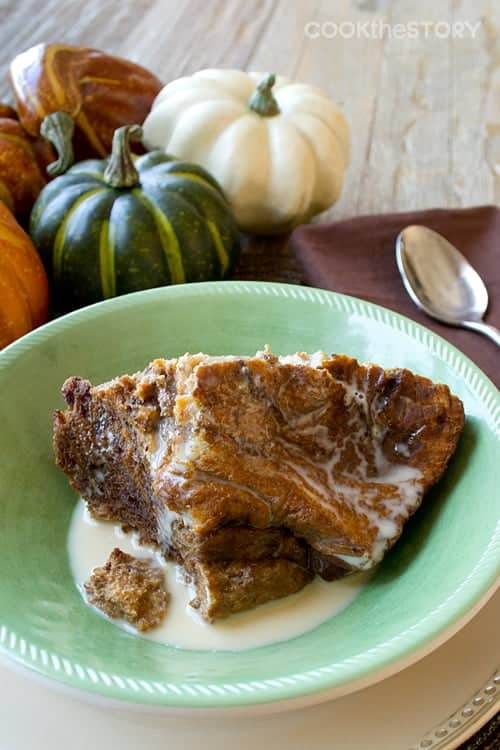 Put this bread pudding together the night before* and when you wake up your house will smell like pumpkin pie. This is meant to be a breakfast recipe and so isn't very sweet. If you would like it sweeter, increase the brown sugar to 1 and 1/4 cups. I like to serve this bread pudding for breakfast with a drizzle of whole milk or cream. For dessert, a scoop of vanilla ice cream is lovely. In a medium bowl lightly beat the eggs with a whisk and then add the milk, pumpkin, brown sugar, pumpkin pie seasoning, vanilla and salt. Whisk until just combined. Rub the butter along the bottom and all around the sides of [url:1]a 3 quart slow cooker like this one I've linked to here[/url]. Spoon 1 cup of the egg batter into the slow cooker. Lay 3 slices of bread in a single layer onto the batter in the slowcooker, overlapping the bread slightly so that they fit. Add 1/2 cup more batter and then 3 more slices of bread. Continue until you have used up all the bread. Pour remaining batter over the top. Turn the slow cooker to low, cover it and let it cook for 7-8 hours. Remove lid and, leaving the slow cooker on, for 20 minutes to evaporate some of the moisture. *Consult your slow cooker's safety instructions to ensure that you can leave it running unattended overnight. I don't really like having anything running while we're asleep, and I urge you to be cautious when doing so and to do it at your own risk. I’ve teamed up with some of my friends to bring you a great list of breakfast slow cooker recipes today. There are 10 amazing recipes to check out and I think you’ll love every one of them. If you love slow cooker dishes, then check out the hashtag #crocktoberfest2013 on facebook, twitter, and instagram to find all the other recipes that will be shared throughout the week. I’d love it if you’d help me get over my slow cooker skepticism even more by telling me about a slow cooker recipe that amazes you. Head down to the comment section to fill me in. Disclosure: This blog post containes affiliate links. If you click on one and then buy something, I will earn a small percentage of the sales. All opinions are my own.